Thrombin Time (TT) is a common clotting test used to detect fibrinogen abnormalities, and the presence of heparin and other thrombin inhibitors in human citrated plasma. 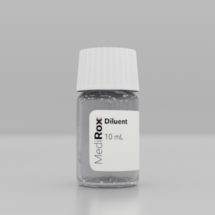 MediRox has developed two different TT reagents in order to meet different instrument performances and different market requirements. Thrombin Time is a clotting test, measuring the ability of exogenous thrombin to convert fibrinogen to fibrin, followed by fibrin polymerisation and clot detection. The time taken from addition of thrombin to citrated plasma, to fibrin clot formation is recorded as the thrombin time and presented in seconds. hereditary dysfibrinogenemia and to detect the presence of heparin and/or thrombin inhibitors in human citrated plasma. Several conditions will result in a prolonged thrombin time, including low fibrinogen concentrations (hypofibrinogenemia), malfunction of fibrinogen (hereditary dysfibrinogenemia), fibrinogen degradation products, direct and indirect thrombin inhibitors such as heparin, hirudin, dabigatran (Pradaxa®) etc.